The London Film Festival is up and running once again, and throughout the next couple of weeks you can expect reviews of some of the biggest titles playing this year, ones which are sure to become major players in the forthcoming awards season. To start off, I’ll be taking a look at the Opening Night presentation of A United Kingdom, the new film from Belle director Amma Asante which has already gotten attention as a possible contender in the wake of last season’s #OscarsSoWhite controversy. Opening Night galas at the Festival tend to be hit-or-miss, though in recent years with films like The Imitation Game, Suffragette and Captain Phillips there have been far more hits than misses (like, does anyone even remember 360? Or Never Let Me Go? That’s what I thought…); in this case, A United Kingdom is definitely a hit, and has the strength and emotion to make it a potential crowd-pleaser upon its UK release next month. As a major awards contender, however, it might be a little trickier to get the ball rolling, but that’s more down to some of the film’s more saccharine moments. Asante directs and Eye in the Sky writer Guy Hibbert pens the true-life tale of Seretse Khama (David Oyelowo, also a producer on the film), a Botswanan Prince studying abroad in London, in post-war 1947. There, he crosses paths with a local girl, Ruth Williams (Rosamund Pike), and their love for each other grows so strong that Khama proposes to her when he has to leave for home, which she accepts. However, their eventual marriage sparks outrage both in the British government, which is determined to uphold the Apartheid way of life in the Commonwealth parts of Africa, and back in Botswana where Khama’s family and tribe refuse to easily accept the white woman their future King has chosen to marry. In another director’s hands, this could have so easily been a story about a white person facing major scrutiny in a mostly-black community, with hardly anything else mattering because it’s clearly so hard being white. But Asante proves to be the right person for the job, as not only is the film much more interested in both the interracial romance that sparks such controversy, but also the more severe impact it has on Khama’s legacy and his dalliances against the political environment he was manoeuvring about in, a strength that was previously hinted at in the director’s previous film Belle. The political figures in this film, including Jack Davenport and Tom Felton’s slimy civil servants Sir Alistair Canning and Rufus Lancaster respectively, are certainly made more villainous for dramatic purposes, but it helps to drill in the point of how a man such as Khama was treated by colonialists simply because he fell in love with a white woman. The imperial brutality of segregation in post-war Africa is also explored, with many outlets having “Whites Only” signs outside their doors, in a country where non-whites make up the larger part of the population, something that even a Prince such as Khama must stick to by entering through a less glamorous entrance to a hotel. It is a rather troubling account of how British colonialism ended up doing more harm than good when interfering in African affairs, and it’s brave enough to even implement Winston Churchill as being a figure of betrayal and mistrust, in a later shock revelation that will have you siding against the wartime figure, a feat not thought possible in this society. It is by far more Khama’s story than Ruth’s, at least in the political sense, but what Asante remembers is to make the romance firmly central to everything that transpires. It’s a solid romance as Oyelowo and Pike have easy chemistry with each other that doesn’t feel too forced or too contrived, and they are a lovely couple to watch together, even when the film depicts their darker moments as a result of their union. However, what I will say is that Hibbert – despite being a fine writer, something proven by his previous script for Eye in the Sky – doesn’t give them many actual conversations to have with each other, other than to share how much they are in love with one another, and at times it can come across as a romance that’s strictly a movie romance rather than one that’s meant to be more grounded in real life. It’s something that I could have personally used a little more of, but that doesn’t take anything away majorly from the connection between the two actors on-screen. Despite missing out on an Oscar nod a couple of years ago for his remarkable turn as Martin Luther King in Selma, Oyelowo proves with this film that proper recognition is an inevitability for him, it’s just a matter of time before that actually happens. He carries the film with charisma, gravitas, and genuine warmth that you really root for this guy to get everything he deserves, but none more important than the love of his dear wife. The film definitely has the ingredients that should make it an awards contender, from the crowd-pleasing nature of the story to the solid social commentary of a segregated post-war world, but whether it can go the distance is a bit more questionable. There are moments that play it too safe, and parts of the romance – while mostly endearing – can become a little sappy to swallow with ease. That might potentially put some people off, and even I wouldn’t necessarily label it as the one to beat this coming season, but even so A United Kingdom is solid enough to recommend even to non-awards voters. Just as long as Asante keeps getting work, then all will be absolutely fine. 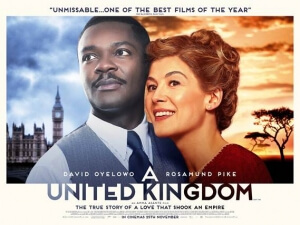 A United Kingdom is a solid romance film set amidst the backdrop of post-war Apartheid Africa, directed with grace and dignity by Amma Asante and led by a powerhouse performance by David Oyelowo.